The PERIOD you set for candlesticks in your strategy is very important, since it has a big effect on EMA1 and EMA2 . This article provides a really quick overview of what the impact of PERIOD is. A single candlestick is a visualization of the opening, closing, high and low prices within a certain timeframe. The most commonly used values for this timeframe (PERIOD) are 5 minutes and 15 minutes. The closing price of each candlestick is used for calculating EMA1and EMA2. Using shorter candlesticks results in more price movement around EMA, this can be great for trading, but also be risky because you are fixated on short term trends only. 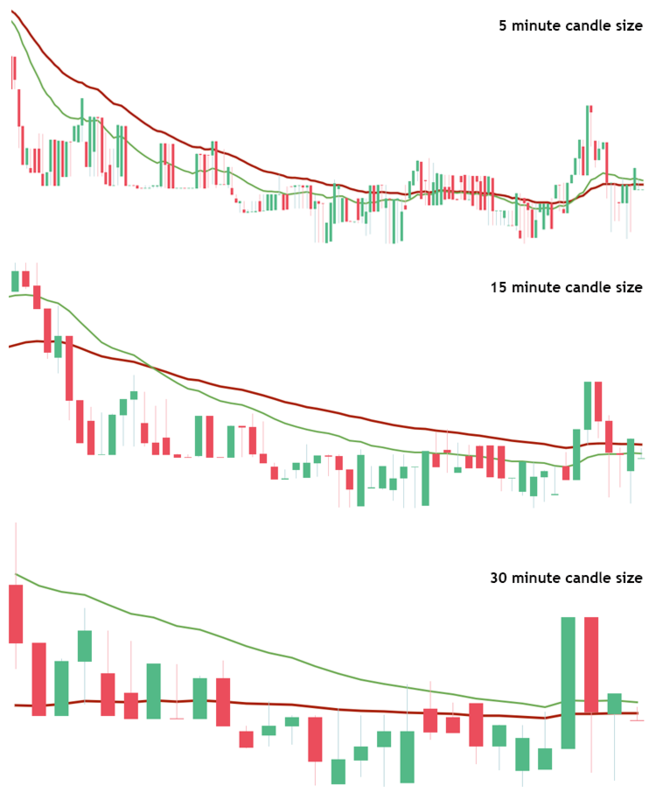 In the image below, you can see the effect on EMA (the green and red lines) when using different candlestick sizes, while keeping other variables the same. tl;dr: Set PERIOD low to trade on short trends, set it higher to trade on longer trends. Gunbot supports different values for PERIOD for each exchange.